H/T to Gabi for this one. Currently being absolutely devastated that a friend spilled his orange juice a week ago on my MacBookPro, blogging will remain rather light until I get a replacement which may take up to 6 weeks for the new matt screens on the 15-inch Mac laptop. As I only have a HP 9000 with next to no software on it, earlier downgraded from Vista (a complete disaster from my view) to XP, after days of playing around with system software - which doestn`make handling a SoftMicro system exactly easier - I take the freedom to reduce my web presence as a watcher, not blogger. Ironically Bill Gates praised Apple as the best machine he had ever seen and this is the year I was initiated to become an Apple devotee. But first listen to Microsoft Founder Bill Gatesbefore you read on. Pricewise Apple was out of reach in 1984. At the small Austrian financial news agency Wirtschaftspressedienst I co-founded in 1988 we had used Atari ST`s as it was a nice graphic user interface (GUI) for a third of the Apple price tag. SoftMicro at that time had DOS. Did you ever run into a PC user (except tech nerds) that was delighted about DOS? I have not. Apple`s system was no. 6 and it progressed in the late 1980s to system 7. Comparing Windows 7 beta to Apple`s sys 7 I have arrived at the decision that the 20 year old Mac operating system is still superior to what MS will issue later this (or next) year as their latest master piece (????). Using Mac laptops since the laptop numbered 170, that was brought out in 1992, I always preferred the ease of use compared to Windows computers where I waste on average 70% of computer time with trying to get the (expletive) machine running again. Using a HP Pavilion 9000 at the moment I just hate to work with inferior software outside the smooth Mac environment. Sorry Mr. Gates, you have to catch up some 20 years of operating elegance. Windows Vista had crippled my network in January and it took me 3 weeks just to get the WLAN running again. On the way Microsoft`s manuals and help documents always drove me to the most idiotic answer, "Contact your system/network manager!!" Hahaha, for my network that`s me!! The biggest mistake that ever happened to me was not to buy Apple shares in 2003 - they have become a 400-bagger or more since - when I bought a 17-inch Powerbook G4. The thing became red hot in my lap, but it never failed me once and on average I had to reboot the system once a week. This HP with XP Pro I am sitting on front of right now, needs to be rebooted 2-20 times a day (that`s when I get a book instead) and right now I am a step closer to just fold the screen down and throw it away, as it tries do dial something and I cannot figure out how to stop this annoyance. Apple told me today that the waiting time for my replacment MacBookPro with an eye-friendlier matt screen will be up to 6 weeks. 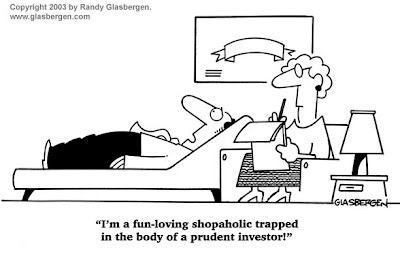 This proves my beloved anecdotal experiences when shopping. If these Apples sell faster than they can put them in the shelves and I may have to wait 1-2 weeks just to get a rental laptop the company is doing something right..
As the US stock market still holds at crazy levels with PEs above 100 I would not buy Apple now, but I will certainly be looking in a year from now whether Apple might not be at true bargain levels again. Oh yeah and I intend to short Microsoft once this current relief rally fades away and the S&P 500 is in the 900s, as this signals for me a continuation of this long term bear market. DISCLOSURE: 3 Macs in the family, one currently broken - and nobody lends me theirs!! NOTE: Post was redacted for clarity on Sep 1. Ben Bernanke did not have time to celebrate his reappointment for another 4 years as Federal Reserve chairman on Tuesday. The day before US president Barack Obama decided to keep Bernanke as Fed head information provider Bloomberg dropped a new bomb shell regarding a lawsuit initiated by the news agency under the Freedom Of Information Act (FOIA) against the Fed. Bloomberg requires the Fed to publish who got the $2 Trillion in bank aid. Find all the details of the pending lawsuit in this post from November 7, 2008. The Fed appealed this FOIA request last December, citing concerns that this information would endanger the borrowers of the $2 Trillion. the U.S. is facing "an unprecedented crisis" in which "loss in confidence in and between financial institutions can occur with lightning speed and devastating effects." Manhattan Chief U.S. District Judge Loretta Preska rejected the central bank’s argument that the records aren’t covered by the law because their disclosure would harm borrowers’ competitive positions. The collateral lists "are central to understanding and assessing the government’s response to the most cataclysmic financial crisis in America since the Great Depression," according to the lawsuit that led to yesterday’s (Monday) ruling. from Republican Congressman Ron Paul who tries to win a majority in Congress and the Senate for an official audit of the Fed. "When an unprecedented amount of taxpayer dollars were lent to financial institutions in unprecedented ways and the Federal Reserve refused to make public any of the details of its extraordinary lending, Bloomberg News asked the court why U.S. citizens don’t have the right to know," he said "We`re gratified the court is defending the public’s right to know what is being done in the public interest." David Skidmore, a Fed spokesman, told Bloomberg the Federal Reserve Board’s staff was reviewing the ruling and declined to comment on it at this time. This ruling is certainly a milestone in the possible end game of the Fed which has come under fire from all sides due to its policy of showering irresponsible institutional lenders with Trillions while the rest of the economy is teetering on the brink of a major depression, induced by more than 2 decades of loose monetary policy. Astute observers will remember the blunders of the Fed which does not know where $9.55 Trillion in unbacked Federal Reserve Notes went. I end this post with the most important question of all: Who Owns the Federal Reserve? Resolving this question may become the most important task in the coming era where the world will see more economic and political turmoil than ever before in history. After all Bernanke is only the figurehead. His captains are the unknown Fed shareholders and for the time being the world economy`s fate lies in their hands. His thank you to president Obama is only a PR stunt; I`d prefer to know who else decided to keep the biggest money printer of all times in the pilot`s seat. Get involved in this: Use the multitude of Fed inquiry forms on the Fed`s website here and mail me any answers you get. My former requests did not lead anywhere, but I am not a US citizen who has a constitutional right to be informed about the government`s actions. Fretting around because my Mac did not like half a cup of orange juice and its owner simply hates clunky and illogical Softmicro "technology" I am delighted that Vancouver based Sean Rakhimov, editor of SilverStrategies, offered this guest essay about the trouble with persistently correct forecasts in markets and in general life too. I´ll let Sean speak in his own words and hope you find them as interesting as I do. We have been pondering for some time now, exactly why most forecasts (let's focus for now on those that DO pan out) fall on deaf ears. Why is it we wondered, people en masse categorically refuse to pay attention to forecasts which – should they come true - could potentially have a dramatic impact on their lives? Take for example oil prices. Pundits, such as Jim Rogers, have been predicting $150 oil for years. He said it over and over in books, articles, interviews and speeches. If you had any interest in the subject, you must have heard it. Heck, he started a fund, created an index and spent the last decade putting his money where his mouth is - quite successfully, we might add. If you had it in you to consider his take on things, you couldn’t buy more evidence that the situation merits a second look, even if your life depended on it. Yet, most people simply ignored his forecasts. Not only that, today when oil price is again below $70, complacency reigns supreme towards what's in store for oil a couple of years down the road. Whereas, chances of 500% increase in oil price in the next 10 years are at least as good or better as it going down 50%. Do you see a problem there? If so, why do we - investors, consumers and "experts" alike – concern ourselves with the downside of oil prices? George Carlin talked about it – this utter and ultimate inertia of mind regarding anything that doesn’t include a ball game, beer and food. Perhaps, the answer lies in the human psyche, in that we subconsciously refuse to deal with things that don’t disturb our immediate comfort. Of course, the whole purpose of this exercise is to learn from this experience and adjust our radars to better guide us in the future. However, these subtleties of human nature were not lost on everyone. We remember the day in 2005 when laws in the US were changed to make the process of declaring personal bankruptcy more difficult. What caught our attention at the time was that the new law was not to go into effect for another 18 months from the day it was passed. Similar tactics are employed in other areas. Adjustable rate mortgages (ARMs) come to mind. Indeed, why would anyone worry about paying double or triple the monthly mortgage payment that s/he can barely scrape up now, if it won't happen for a few more years? Note, that in the case of ARMs, the degree of certainty that monthy payments would go up was almost absolute; yet folks still chose not to think about it. On the flip side, the "low introductory rate" was the only way to saddle millions of Americans with mortgages they could not afford. There are exceptions, but they prove the rule that those who took on mortgages they couldn’t afford had to be either delusional about their financial future, reckless or dumb enough not to understand the consequences. Or they simply didn't think about it on account that it was far enough in the future that they didn’t have to. In the same way today they don't think about $10 gas and what it will do to their lives. Back to forecasting. It seems that forecasts are doomed to be ignored no matter what and, at the same time people can't get enough of them. However, people will only listen to forecasts that shall we say, "fit their agenda" or otherwise "approve of" their lifestyle. They will have none of the talk to the contrary, or even that which materially differs from their position and thus puts their own perspective in question. It's virtually impossible to consistently correctly forecast short term developments (not that folks don't try since that's where the demand is), which in many ways decreases the utility of those forecasts that do come true by reducing the overall percentage of good calls. You almost have to be a fore-teller, rather than a fore-caster to be taken seriously, which is a whole different story, unworthy of wasting our time on. It is our belief that short term forecasting with few exceptions is largely inaccurate and useless to boot. After all, for a forecast to be useful, you need to have enough time to integrate it into your thinkin and make necessary changes and/or preparations in order to position yourself to benefit should the forecast come true. More importantly, whatever you do, you want to do ON YOUR TERMS, which usually implies plenty of lead time so that there is as little disruption (and cost) as possible to your way of life. Longer term trends which are easier to spot and act upon, are ignored because investors are too busy chasing short term gratification. The bigger picture totally escapes them despite the knowledge that the likes of Warren Buffett bet exclusively on longer term dominant trends and enjoy greater success with less hassle. It is very easy even for a man on the street to figure out that long term gold and silver prices are going much higher. It is more difficult at any given point to predict what will happen to them in the next few weeks or months. More importantly, the utility of short term calls is largely marginal. Unless you are a trader, in which case you are reading the wrong paper, the beef is in the long term moves. Yet you will get a lot more attention discussing a 30% move in 6 months than a 500% move in the next 5 years, which is absolutely astounding. The last bit of "conundrum" we have to confront is this: the vast majority of investors will talk a good game. They know it all and knew all along and they know someone who made "millions" in this-that-and-the-other. They know how to do it and what to do and when. They know everything. They will talk to you for six hours straight, ask a lot of interesting questions and come across as well reasoned and perfectly sane people. They simply can't make a profit. Not the type that makes a difference. Not over the longer term. Not consistently. They just want to talk about it. They want you to talk about it and they want to talk about it themselves. Here's one thing that forecasters get wrong: they keep talking about investors. We do it too. Trouble is that in this particular cycle, investing and survival are almost perfectly aligned. Nobody was going to starve if they didn't put money in dotcom's or airlines or countless other ventures that went belly up in the not so distant past. Turns out, moving your money out of paper into hard assets is not really optional. Not in the long term and, as we established above, the short term doesn't matter. Things that are going up in price this go around – food, energy, metals, natural resources - are essential to our way of life and have the potential to be the difference between starving or not in the coming years. Hence, they are not for investors only, they are for everyone. as I have run my powerbook out of control - Screwdriver - blogging will continue only once my MacBookPro is repaired. Everything should be back to normal by next week. I apologize not to run my daily criticism until this hardware failure is revolved. As I still have not come across any temptations - except a table full of Beijing Duck without oyster sauce (!) - to visit China and take in state sponsored growth on steroids (bad loans), Hedge Fund Manager Hugh Hendry Brief of Eclectica Asset Management has done some on-the -ground-research. Don't mistake it for Atlanta or Miami, this video was done in one of these south eastern China metropoles Westerners may have known until now as the figurehead of limitless Chinese economic growth. VIDEO: Note that all empty standing sky scrapers represent billions and billions in investments gone bad. Austria's central bank OeNB will only sell minuscule amounts of gold in the next 5 years. OeNB executive Peter Zoellner said in an interview with Austrian Press Agency APA that Austria has no plans to sell any significant amount. Austria is a member of the 18-strong CBGSA. According to the OeNB executive Austria owns a hoard of 280 tonnes that is stored in Austria, Switzerland and the UK for easy market access. A report in Boersenexpress says that Austria may have sold 37.5 million troy ounces in the frame of the last CBGSA. It is believed that Austria has not sold any gold since 2007, following a very conservative but nevertheless profitable investment strategy this way. Zoellner had always emphasized that gold plays a very important role in monetary policy. Having blogged about Austria's silver shortage to the tune of €1.2 bilion the central bank is also a gold lender. OeNB did not indicate the size of gold leasing with Zoellner only saying that it regarded only very small sums which are underlaid with secured collateral. Unicredit analysts have compiled a detailed study on the Central Eastern European (CEE) banking sector (HT Ed Hugh). While I cannot share their wishful thinking in terms of a speedy recovery this is nevertheless a compact first-hand guide to the area that will decide the fate of Austria's major banks. I recommend you to download the 46-page PDF here as it has a valuable annex on the top players by country. This is a good base to estimate foreign banks' risk regionally. GRAPH: First some bank macro. Except for The Czech Republic, Slovakia and Turkey loan/deposit ratios show a net indebtedness for all other CEE countries. Table courtesy of Unicredit. Click to enlarge. Anecdotal evidence tells me that credit will furher contract in a death spiral of an economy trapped in deep recession while banks stop lending. 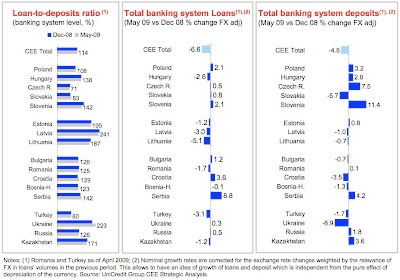 Pick the banking group of your choice if you intend to gamble on the CEE recovery. 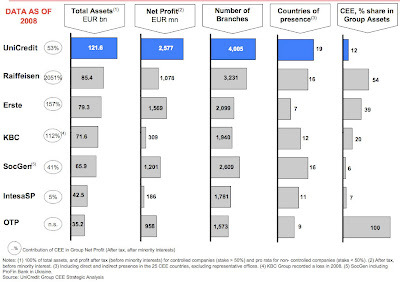 GRAPH: Top banks by volume in CEE. Raiffeisen International has the biggest exposure and is active in Russia and the Ukraine, both contracting like - well, the rest of the earth. Chart courtesy Unicredit. Click to enlarge. Another decision helper concerning risks and rewards in CEE may be IMF commitments. As said, if the sky caves in on CEE Austria may face the biggest problem only in the future, contrary to the modest optimism banks put on their face these days. GRAPH: The IMF's commitments to CEE engulf tiny Austria whose fate is highly dependent on a recovery in its former eastern territories. Chart courtesy Unicredit. Click to enlarge. If you are in the mood to have a few more pages of worthwhile CEE information, download this PDF from Erste Research Group. I have absolutely no idea why this blog's homepage freezes when loading in Firefox since this morning. Maybe this happens only in my Firefox configuration and others fare better? As I am not the tech-wizard to find out or correct the mistake I kindly refer you to use Safari or Opera browsers meanwhile. All works fine there. Don't ask me about Softmicro's Internet Explorer as I use a Mac. UPDATE: All back to normal again. Gotcha! Stop immediately playing Klondike while waiting for the release of the Federal Reserve's Open Market Committee (FOMC) statement later on Wednesday. Here comes a version that was not agreed on next to the fire place in the FOMC meeting salon but that may be as non-committed as the official version will be. Observing that the FOMC has a tendency to use the respective last minutes as a base for the upcoming version I am not expecting too much of a change. As the Fed is on ZIRP (zero interest policy) auto pilot while fundamentals have not changed for the better in the current summer lull (calm before the autumn storms?) and one can expect that the introducing paragraph will not change very much. Information received since the Federal Open Market Committee met in April suggests that the pace of economic contraction is slowing. Conditions in financial markets have generally improved in recent months. Household spending has shown further signs of stabilizing but remains constrained by ongoing job losses, lower housing wealth, and tight credit. Businesses are cutting back on fixed investment and staffing but appear to be making progress in bringing inventory stocks into better alignment with sales. Although economic activity is likely to remain weak for a time, the Committee continues to anticipate that policy actions to stabilize financial markets and institutions, fiscal and monetary stimulus, and market forces will contribute to a gradual resumption of sustainable economic growth in a context of price stability. On a macro level there are no events that changed this picture since June 24 in either direction. Consumers who still hold a job are more focused to pay down their debts than to splurge again. The surprising retracement of the US unemployment rate to 9.4% (9.5%) last Friday has been unmasked as a statistical trick that results from a tilted birth-death model, seasonal adjustments in the car industry and other tricks to square the circle. Does it matter? Yes and No. As the US only estimates its armies of the unemployed and does not properly count them, the whole model is skewed at best. The prices of energy and other commodities have risen of late despite ongoing sluggish economic activity. Given that oil holds up surprisingly well despite lower consumption forecasts the Committee nevertheless expects that inflation will remain subdued for some time. The big joker will be the last para from the June statement as the Fed had then announced to print another couple of hundred billions to prop up mortgage markets, monetizing the debt in this market segment. If the Fed announces still more liquidity for ailing markets, the long end may see a sharp uptick in yields, currently at 3.75%. In these circumstances, the Federal Reserve will employ all available tools to promote economic recovery and to preserve price stability. The Committee will maintain the target range for the federal funds rate at 0 to 1/4 percent and continues to anticipate that economic conditions are likely to warrant exceptionally low levels of the federal funds rate for an extended period. Not much to add to this. We can also remain confident that the Fed will, as always remind us that they are watching markets day and night. Alas, this did not help them to avert the crisis we are in. Sorry Ben, you are about to lose the game with your limitless creation of fiat money. While all these new liquidity injections may have helped to keep short term rates at bay I cannot see how the Fed will ever be able to get rid of all these toxic assets on its 2 Trillion+ balance sheet, purchased at mark-to-fantasy prices without taking down those credit markets it hopes to keep stable with the poison of still more liquidity. Actually markets may have a much more vital interest in the following questions, that will certainly not be answered in either the statement or any other release of the Fed. Who got the $500 billion you swapped with foreign central banks? Where are the $9 Trillion your chief accountant cannot account for? Who got the $2 Trillion in bank aid? Whatever the Fed will release tomorrow; take it with a grain of salt. After all, chairman Bernanke once had elaborated that the FOMC meetings should be on live TV. Given its secretive posture regarding the 4 questions above I am not convinced that we will see the necessary changes in information policy that would be needed to reinstate trust in the world's biggest central bank. This is the mess that Greenspan made and history reserves a sad place for Bernanke, whether he likes it or not. Official Chinese TV announced last week that silver bullion is now available for the investing public. China, once on a silver standard where nobody knows today what happened to the hoard, now offers 500 gram, 1-, 2- and 5 kilo bars. The newslady alluded that silver is comparatively cheap to gold, citing the current gold-silver ratio of 1:70. I could not think of a fundamentally bigger bullish sign for silver than China's move. PBoC Will Keep Lending at High Levels - China in a Bubble? Fighting a harder Yuan while increasing domestic lending may pose new problems for China's central bank, PBoC. The Chinese central bank promised in a press conference last Friday to keep monetary policy loose. The government will not change its stimulus policies because it could derail its hard-won economic recovery, though record bank lending in the first half of the year has raised fears over credit risks and asset bubbles. "The central bank is still committed to a 'moderately loose monetary policy'," said Su Ning, deputy governor of the People's Bank of China (PBOC), at a press conference in Beijing on Friday. "When we say 'dynamic fine-tuning', we do not mean the monetary policy but the monetary policy operations. We will sharpen the focus and intensify the pace of the policies," Su said. China's economy is expected to slow to a growth rate around 6% this year. The government has to walk a fine line in its monetary policy: Facing imploding exports that may require to keep the Yuan on the hard side are contrasting with a domestic stimulus that may carry higher inflation in its pouch. China denies to consider asset prices a point of concern in its monetary policy decisions. So far it appears willing to let credit grow further. The country's banks have lent nearly 7.4 trillion yuan ($1.08 trillion) in the first half of the year - far higher than the initial full-year target of 5 trillion yuan. On the back of the unprecedented rise in credit, the Shanghai Composite Index has rallied about 80 percent this year and real estate prices have rebounded to record levels in some major cities. Some economists say much of the country's massive $586-billion stimulus package and record lending in the first half may not have been spent on real economic activities and created asset bubbles. "How far the bubble will go depends on the government's liquidity policy," said Xie Guozhong, board member of Rosetta Stone Advisors. China may nurse a consumption bubble. Anecdotal evidence has it that "buy to let" condos in cities of China's dynamic Southeast lack renters. A property bubble plus bad credit reinvigorates pictures seen in the USA and Europe. Banking on a stable Yuan may prove to be as much of a Russian roulette as holding Federal Reserve Notes. All money figures have become irrelevant as Treasury secretary Tim Geithner needs to come up with historic record amounts necessary to finance a $1.3 trillion - others say $1.84 trillion - budget deficit. Watching America's economic disaster from a car window may be a better guidance than many other lagging indicators. The video below may remind you of Baghdad without the military. But this is Detroit without an industry. VIDEO: This 10-minute drive around Detroit tells me more about the chances that the US will descend into the 3rd millennium Depression (3MD) than any lagging indicators. Can anybody imagine a V-shape recovery here? This comes at a time when the Fed has run out of interest rate stimulants and president Obama nods off billions of Federal Reserve Notes (FRN) so his bookkeeper Geithner can continue to burn them at 4 times the speed as Paulson did a year earlier, nationalizing everything tabled to Obama on his way of change that looks increasingly different from his campaign promises. The next step? Geithner will ask to raise the debt ceiling of $12.1 trillion. ...the Treasury is romping up borrowing to unprecedented levels to fund stimulus and financial bailout programs and cope with a deep recession that has devastated tax revenues. It is expected to issue net new debt of as much as $2 trillion in the 2009 fiscal year ended September 30 and up to $1.6 trillion in the 2010 fiscal year, according to bond dealer forecasts. The 3MD fighter in the White House looks a bit like the king without clothes as plunging tax revenues and an army build-up in Pakistan (war #3) come hand in hand with record social transfers and record bankruptcy figures on public and private levels. In the 10 months through July 2008, (fiscal) outlays rose by almost $530 billion (or 21 percent) and (fiscal) revenues fell by more than $350 billion (or 17 percent) compared with the amounts recorded during the same period last year. Depressed equity prices have shrunk America's wealth invested in the stock market from $22 trillion to $12 trillion. I am not very confident that those people who abandoned Detroit will show up as new consumers anywhere else. Now add the number nobody knows - total negative equity of US home owners/bank slaves - and yep, we can add another couple of $,$$$,$$$,$$$,$$$ (thats trillions) to the debt tab. VIDEO: Popped bubbles: Hooverville in Fresno, California. This looks like a refugee camp from the so called 3rd world. Youtube does not yet have a category for European tent cities. Watching economic implosions in Central Eastern Europe - Slovakia, Czech republic, Latvia, Lithuania etc. and soaring unemployment rates of up to 22% like in Spain I would not rule out such scenes of poverty in the mid term future. Continental Europe has a higher quota of people renting than buying and social housing is available in most European countries, probably masking fundamental economic troubles to a good degree. Most German unemployed can claim housing benefits. Predicting an L-shaped economy in the USA, Europe is at best set for a W-recovery and this depends highly on future stimuli. Big remaining problem: Europe has like the USA only empty pockets. The ECB today released the extension of its central bank gold sales agreement (CBGSA) for another 5 years while cutting back planned sales from 500 to 400 tons annually. Maybe central banks have rediscovered that gold reserves are undoubtedly the best performing asset class on their balance sheets. The CBGSA or Washington Agreement was signed by 18 central banks, with the Federal Reserve being absent like in the decade before. 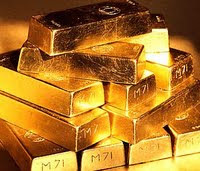 Gold remains an important element of global monetary reserves. The gold sales already decided and to be decided by the undersigned institutions will be achieved through a concerted programme of sales over a period of five years, starting on 27 September 2009, immediately after the end of the previous agreement. Annual sales will not exceed 400 tonnes and total sales over this period will not exceed 2,000 tonnes. The signatories recognize the intention of the IMF to sell 403 tonnes of gold and noted that such sales can be accommodated within the above ceilings. This agreement will be reviewed after five years. Bloomberg has a good write up on the matter, pointing out that the IMF has not signed the agreement, opening the possibility that the IMF's intent to sell 403 tons of its 3,217 ton hoard in one go to one country may become a reality. Central banks sold 73 percent less gold in the first half and full-year disposals may drop to the lowest since 1994, according to estimates from London-based researcher GFMS Ltd. The IMF wants to sell 403 tons from its reserves of 3,217 tons, the third-largest holding after the U.S. and Germany. “The IMF has not signed and this leaves open the possibility that the Chinese, Russians, another central bank, could buy the 403 tons of IMF gold in one go,” Reade said. The Swiss National Bank, one of the signatories to the new accord, in a statement today said it isn’t planning any gold sales in the near future, and that its gold is an important part of monetary reserves. Switzerland has 1,040 tons of gold, making it the seventh-largest holder. Bullion sales under the current agreement total 140 tons in the current quota year, with France and the ECB leading sales, the World Gold Council said July 29. Central banks have sold about 3,867 tons since the first agreement, and failed to reach the allowed limit each year since 2005, its data show. Central banks of China and Russia will probably be delighted to see their efforts to build up larger gold reserves helped by European central banks at low prices. China has overtaken India as the largest gold importer this year. In the long run the massive sales of gold may be seen as the biggest fallacy of central banks next to their premature rate cuts, leaving them now out of ammo. Chart of the Day: A Major Bull Trap in the Making? This chart may turn out to be the most important guidance from the past. Paper Economy blog delights the bears with this overlay of the Dow 1930 and the S&P 500 this year. 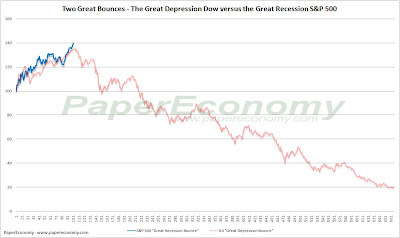 Given the severity of this downturn and a Fed looking even more helpless now than 80 years ago I would not be surprised to see the S&P 500 taking roughly the same course in 2009 - 2011 as the Dow did then, reaching its historic low only in 1932. Looking at the chart above is another good eye opener of the biggest imbalance the world has ever seen. These days 3 jobs are the toughest in the world. Would you want to be in their shoes? US Treasury Secretary who has to raise $490 billion (AP says it is $1.8 trillion) in order to finance this year's record deficit, confronted with a growing unwillingness of China to finance the US war-machine. Chairman of the Federal Reserve who will increasingly monetize debts while shielding the dollar from an implosion, ultimately in vain. China's Treasurer who has to diversify out of more than $2 TRILLION, keeping the write-offs as small as possible. Common sense suggests that option #3 looks comparatively better than the US trillion printers and handlers, the Fed and the Treasury. Now lean back in your chair, cushioned with $2 TRILLION debt paper and ride through this monopoly game with the highest sums of money ever at stake. As the clouds above markets turn darker and darker there is not much time left to start spending the 2 trillion before they devalue more. China does not have very much time left. With a possible worldwide financial collapse close ahead China will have to run for the exit before all other holders of US denominated pieces of debt paper. Rocketing unemployment in the Western world has left deep scars in China's most recent export statistics. 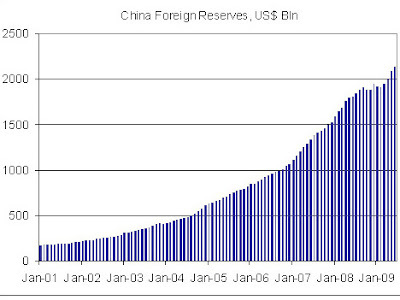 So the Chinese took the first $600 billion in order to spur domestic demand. Now what to do with that shrunken surplus of only $1.5 trillion? Considering that China plays good cop - bad cop, either talking up Treasuries or firing broadsides against a Ponzi scheme played with Federal Reserve Notes (FRN) it can be expected that China knows it cannot bail out of FRN debt without taking some potentially hard hits down the road. to buy commodities of all sorts, this explaining its #1 position as copper importer. China's coal import hit a new monthly high in May, while coal export slumped to a 11-year low. The latest statistics from the General Administration of Customs showed China's coal import reached 9.43 million tons in May, more than double that in the same period of last year. China's coal import and export amounted to 32.20 million and 10.53 million tons respectively in the January–May period, or a net import of some 22 million tons. Industry insiders predicted a net import of more than 30 million tons of coal for the whole year of 2009. In a further diversification move China begins - with the approval of its central bank - to buy direct stakes in foreign companies, swapping currency risk for profit/loss risk. China went on a buying spree after the global collapse in demand for oil, metals and other industrial staples, bulking up its domestic government inventories and snatching up overseas assets from Australia to Africa to Canada to safeguard growth. A state-owned Chinese firm bought most of the assets of one of Australia's largest mining companies, OZ Minerals, in a $1.4 billion deal earlier this year. Another, Chinalco, came close in a failed bid to double its stake in global miner Rio Tinto, after Rio struck a separate deal with fellow Anglo-Australian miner BHP Billiton. China's refined copper imports, at 1.8 million tonnes in the first half, were up 160 percent on the same period a year earlier, while primary aluminum imports rose a stunning 16-fold. Chinese buying has helped drive up both Shanghai and London Metal Exchange prices this year, by around 80 percent on both LME and Shanghai copper and 75 percent on LME lead, 40 percent on zinc and nearly 20 percent on aluminum. As a result, there is a risk commodities prices will slump again as China now slows its buying spree. "The risk in the second half of this year is that the rate of accumulation in China must slow down -- one of the factors that a downside correction in commodity prices, however modest, may occur," Roubini said. Roubini only talked metals, but a quick look at MarketSkeptics blog reveals that this year's wheat harvest may decline dramatically due to a fungus. The US reports declining soybean and corn harvests this year, certainly a good support for world market prices in softs. China also underpins oil markets. It is known since 2005 that it has been building up strategic oil reserves to smooth futures markets' wide price swings. All in all one can safely conclude that the fate of FRNs lies mostly in the hands of China and its willingness to writeoff a substantial part of its forex holdings or delay this a little more. It will be inevitable to realize losses on its way out of FRNs. The remaining question is only what size of writeoff China will be willing to take. UPDATE: LEAP2020has a much more extensive version of China's FRN trap. Counting the unprecedented amounts of private and personal debt in Europe and the USA is an impossible task. Just imagine to first identify all data input sources only to arrive at the point where debt data has to be offset with savings data, equa(tiona)lly difficult. As all this would be too much of an unreachable perfect world I first throw a couple of figures - like in Texas Hold'em poker - on the desk before telling you the exact amount of the Western world's debt. I may remind readers that the 10 most-indebted countries in the world are the USA by a long shot, followed by 9 European nations. And now after the jump see the exact figure of Western debts. Once we are at exponentially creating new TRILLIONS macro data are no more guidance for a manipulated stock market, where the privileged few appear to have a pre-order order-flow monitoring in operation. Ironically it's said HFT (high frequency trading) computers trashing the debt system where it's not anymore about investing into a company's future but about moving the Himalayas everyday in order to take home a cobble stone. Can somebody dig in the archive when the first 100 million hostile takeover filled business paper's pages? I bet its not more than 25 years. It makes no more sense to bet on a get-out-the-dollar card in the monopoly of debt played nowadays. Federal Reserve Notes will fade sooner than most of us believe. Better be out several months ahead then 1 day too late. The Euro may be around a little longer than Sterling, which may share its last ride with the USA. The faster this biggest write-off in history is behind us, the earlier one could draw plans that include the lessons learned in this global financial meltdown. One thing is undeniably correct: All unbacked paper currencies devalued more than 90% within a human lifespan. In most cases this happened much faster. To now begin again another draft for the modification of a sure-to-fail fiat money concept that always ended in hyperinflation since 1720, when John Law started financing the French king's parties with in specie currency, is like trying to plant palm trees in the Antarctic. Why is there no discussion of a metal standard among the armies of economists that would shine out from the mass accepting fiat currency without second-questioning it first? UPDATE: The financial Tsunami may arrive quite soon, if this FASB proposal will become legislation, forcing all risks on the balance sheets of banks at mark-to-market. Referring to the header of my blog that presumes that we are experiencing a global redistribution of wealth towards Asia I came across the following article in the Chinese paper Sohu. Turn off your lying TV, trash the weekend paper you may be reading: This is nothing else then a declaration of economic war by China. The reasons why Michael Jackson died are completely irrelevant to your future. The total population of China and India now exceeds two billion. Now that they are beginning to compete for resources with people in Europe, the U.S. and Japan, the world's wealth will be redistributed. The direction of the flow of wealth has begun to reverse itself after two hundred years. In ancient times, production equipment had not yet been developed. Natural resources would not have been able to feed the entire population and wars among countries were usually battles for resources. The competition for survival of the fittest encouraged scientific and technological progress, as well as the development of civilization. The Industrial Revolution began in Europe. Over the course of two hundred years, every country in Europe took advantage of the Industrial Revolution to strengthen its military might. Europeans nearly conquered the entire world as their colonies grew and the world's resources were sent to Europe. On the other hand, the Industrial Revolution tremendously expanded the scale of the economy and an enormous amount of capital was required for investment in factory equipment. Thus, a capital market was effectively born. Profits made in the capital market enabled large transnational enterprises to emerge. European countries lost control of their colonies and could no longer use their guns to gain access to resources. Instead, they began to use economic means to determine who would have access to resources. Transnational enterprises played an important role in this transition. Thirty years ago, the economic growth rate of the European, American and Japanese economies far exceeded that of today's developing countries. The U.S., Europe and Japan acquired both resources and wealth. Thirty years ago, Europe, the U.S. and Japan produced two thirds of the world's steel. Even today, the U.S. is home to only five percent of the world's population but consumes 25 percent of the world's available resources. Thirty years ago, I was studying in the northeast of the U.S. In winter, the temperature was minus ten degrees outside, but inside it was warm as summer. I had to wear short sleeved clothing. Over the past thirty years, the poorer countries have begun to develop their economies. The overall standard of living needed to be improved. Therefore, additional resources were necessary. The world's wealth must be redistributed now that more than two billion people in China and India have begun to compete with the six hundred million people living in Europe, the U.S. and Japan for resources. Fortunately, this redistribution of wealth constitutes economic warfare rather than an all-out war of guns, and will be carried out according to economic laws. In the competition for resources, prices will be responsible for redistributing resources. Cheap labor from developing countries replaces European and American labor, allowing developing countries to earn foreign exchange. Developing countries also compete for resources with Europe and the U.S. in the global market, leading to the price hikes of natural resources in the past few years. The world's wealth is gradually flowing to developing countries from Europe, the U.S. and Japan. Wealth starts to reverse its direction of flow within two hundred years. Europe, the U.S. and Japan can no longer maintain the same standards of living as in the past and heat in winter will not be enough. However, no country will simply sit by and watch its standard of living deteriorate. Thus, frictions and conflicts among nations begins. In response to the huge trade deficit in the 1980s, the U.S. placed a limit on Japanese cars, making the dollar stronger than the yen and leading to economic stagnation in Japan for 20 years. The best solution is that Europe, the U.S. and Japan utilize science and technology to assist developing countries with their own productivity and let them have experience economic growth even while these developed countries prosper. However, the human history is one of constant competition for resources. The tidal wave of wealth redistribution has begun. I presume regular readers of my blog do not need any additional explanation what this means. 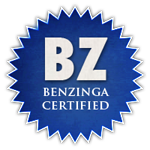 For those new to my blog I recommend to browse my archive or do a "China" label search.